Commercial satellites such as this one from Intelsat could host more military and NASA payloads, government officials say. NEW YORK — In times of dwindling government budgets, the U.S. military, NASA and other federal agencies are increasingly looking to commercial companies for help getting satellites to space. There is a growing movement among government agencies to start hitching more rides for space instruments aboard commercial spacecraft, rather than building their own completely autonomous satellites. 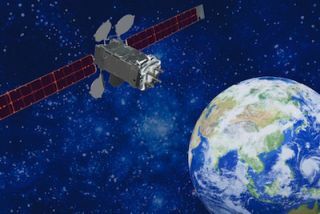 Such a deal is known in satellite circles as a "hosted payload," because a commercial communications spacecraft might "host" an instrument for a Department of Defense (DOD) Earth-observation satellite, for instance. "I think were at a pivotal point in the DOD in terms of our relationship and the best path forward, and I think what's important right now is an open dialogue," Lt. Gen. Ellen M. Pawlikowski, commander of the Space and Missile Systems Center at Air Force Space Command, told an audience of commercial satellite industry insiders this month at the 2012 Satellite and Content Delivery Conference and Expo here. "You've got a lot of satellites up there and I sure would like to hitch a ride." NASA, too, wants in on the action. "We know we can't do everything alone at NASA," the agency's deputy chief Lori Garver said. "We look within the U.S. tax dollar to get you the best benefit by first looking across agencies and then looking to our industry partners." The main attractions of the hosted payload scheme are the price and the wide availability of commercial satellite hosts (around 80 commercial satellite launches are planned for the next five years, Pawlikowski said). Plus, eliminating the need to design a whole new spacecraft from the ground up for each new launch makes sending up new instruments easier and quicker. "It's not just the budget — it's accelerating the science," Garver told SPACE.com. "You can have more science, more quickly." Still, some government satellites aren't ideal for hosting on private vehicles. Many of the military's communications satellites, for example, are too large and heavy, and require too much power, to easily cohabitate with commercial communications satellite, which are also power-hogs, Pawlikowski said. Nonetheless, the Space and Missile Systems Center sees a public-private partnership in space as such a promising idea that it's opened a dedicated hosted payloads office to look into opportunities for collaboration. And Garver said NASA plans to work through that same office to arrange deals of its own. "We see hosted payloads as a huge opportunity, but we're anchored in the reality of the situation," Pawlikowski said. "It's got to be the right match. We really see that commercial satellites will play a key role. It's not a question of whether they will, it's just how they will."